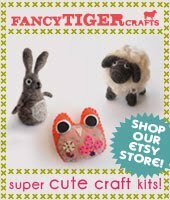 Fancy Tiger Crafts: Crafty New Books! It's that time of year again! Every spring and fall, we get inundated with tons of new books! This spring's new books will keep you crafting all summer long! Here's the lowdown on some of our fave new releases. 1. Happy Home by Jennifer Paganelli. You are probably familiar with Ms. Paganelli because she designs fantastic fabrics for FreeSpirit and she has also written the fun girl's sewing book, Girl's World. Her new book from Chronicle captures her unique style and love of bright colors. Happy Home features sewing projects for everything from bags to dog beds to banners, pillows and quilts. 2. So Pretty Crochet by Amy Palanjian. So Pretty Crochet features 24 crochet accessories projects from 12 different designers. All of the projects are beautiful and delicate with a Victorian flare. If you are interested in making jewelry, mittens or cuffs there is lots to inspire in this stylish book. Some interesting crocheted banners and bags round out the offerings. 3. Unravel. Unravel is a book you will want to display on your coffee table and look at again and again. It details the fashion of knitwear from the 1930's through the present. There are tons of beautiful photographs, vintage ads, and drawings. 4. Improv Sewing by Nicole Blum and Debra Immergut. Nicole and Debra were just at Fancy Tiger Crafts doing a demo from this awesome new book and we are all converts of their style and approach to sewing with knits. 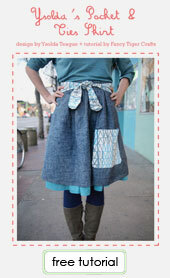 They take the fear out of sewing with jersey through simple, yet classic styles and easy to follow advice and tutorials. They show you how to draft your own patterns so you can make clothes that fit great. This book is perfect for the sewist who is ready to explore the wonderful world of sewing with knits! 5. Fabrics A to Z by Dana Willard. 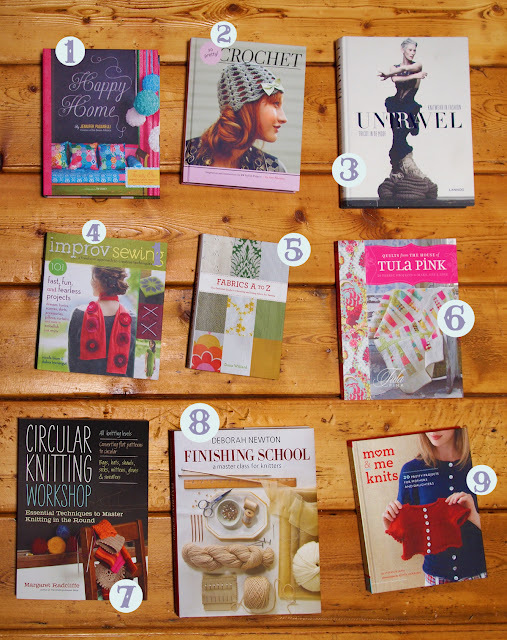 There are so many wonderful books on sewing and finally there is a wonderful book on fabrics! This in depth guide details every type of fabric imaginable and talks about properties, how to care for them, and how to work with them. There are also sections on ribbons, buckles, zippers and tools - a must have book for every serious sewer. 6. Quilts from the House of Tula Pink by Tula Pink. Amber and I are really lucky because twice a year we get to go to quilt market and meet people like Tula Pink. We love her! Her booth is always spectacular because of her amazing quilts. She comes up with interesting designs that are both unique and gorgeous. We are so excited that she has a book out that captures the spirit of her booths at market. There are 20 quilt projects in this book, but also fantastic things like shower curtains, lampshades, and pillows. Now we can all experience the magic that is Tula Pink! 7. Circular Knitting Workshop by Margaret Radcliffe. This new book is a great reference for any lover of circular knitting, or anyone who wants to learn about circular knitting. There are techniques for converting patterns to be worked in round and various methods of circular knitting are explained in detail with great photos. In addition to all of this reference-style information, there are tons of great patterns for everything from hats and mittens to shawls, sweaters, and socks. 8. Finishing School by Deborah Newton. 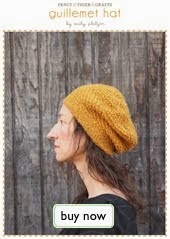 This is another great reference-style book for serious knitters. This book covers everything you'd need to know to properly finish a piece. There are various techniques and tutorials for blocking as well as seaming techniques. Ms. Newton even goes over how to sew on a button or install a zipper. Fantastic! 9. Mom and Me Knits by Stefanie Japel. 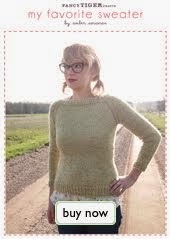 We love Stefanie Japel and are so excited about her newest book, Mom and Me Knits. Stefanie lives here in Denver so we have the pleasure of knowing her and her 2 adorable daughters. Mom and Me Knits features beautiful, classic knits that are sized for both mom's and their daughters. It was wonderful to host Stefanie this past weekend for a release party for this book. If you haven't picked up your copy yet, there are still signed copies to be had! New book titles are coming in every day--next time you stop in we'd be happy to show you our favs!